After last weekends walk along Brighton Beach, it was back to normal this week with a trip to London. With the weather remaining a question mark, I decided to play it safe, stay indoors and visit an art exhibition. It’s something I’ve been meaning to do more since moving down south closer to London as there are so many great art museums. I’ve only been to art museums when travelling abroad and I’ve found I’m most interested in contemporary art. So when I saw The Barbican Centre was holding a Pop Art Design exhibition, I knew instantly what the weekend would entail. My only experience of Pop Art was at an Andy Warhol exhibition in Milan last year – I loved it. It’s hard to describe why and what I love about Pop Art. I think it’s just the bold and brash colours or the simpleness of objects as art – take Campbell’s Soup cans for example. So I was looking forward to learning a little more and seeing other artist’s work from the Pop Art era, and wow did it vary. Unfortunately they didn’t allow you to take pictures and they had a person watching in every room pretty much but I’ve found some images to give you a better idea of what I found interesting. What I didn’t realise was Pop Art was often influenced by the growing popularity of celebrities, materialism and advertising that seemed to engulf America and Britain after the war. A social commentary best summed up I think by Richard Hamilton’s collage titled Just what is it that makes today’s homes so different, so appealing?, which many say this is the first real piece of Pop Art. Created from a number of cut-outs from magazines, the piece comments on the rise of brands like Ford to the advancement of new technologies like TV and audio to the ideals of the perfect body. Heck, some have suggested the Hoover advert of the stairs is a nod to how the cleanliness of homes was a major issue during this period in the 50’s. It’s such a simple piece of art using a technique many of us used in primary school, yet says so much – and that’s the beauty of it for me. I was really pleased the exhibition had more pieces of work by Andy Warhol that weren’t included in the exhibition in Milan. Something I didn’t know about him was he started in advertising. Pretty apt as the work at the exhibition was Coca Cola related. Work which drew my eye instantly were silver painted Coca Cola bottles in a crate and Close Cover Before Striking, a matchbook featuring the Coca Cola logo – both of which I can’t find a CC image unfortunately! Both are shining examples of how everyday objects can become art. Warhol’s design of The Rolling Stones’ album Sticky Fingers was also on display which featured a real zip that when pulled down revealed the model’s underwear – that would never be allowed to hit shelves these days! 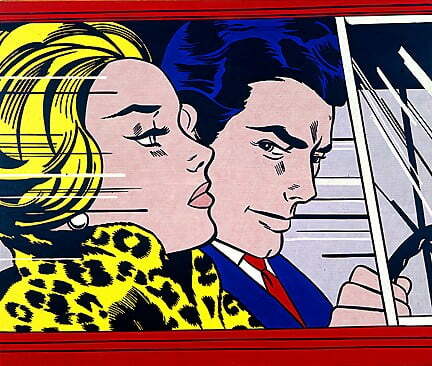 I think my absolute favourite discovery was Roy Lichtenstein’s art work. I’ve seen these comicbook styled strips many times before and it was great seeing In The Car up close. Examining from a close distance you can appreciate the detail as you can see each individual dot in the shading on the characters’ skin. Apparently the original panel had a speech bubble, but I prefer it without. Without a caption, the work is open to interpretation and you decide what is going on in the scene. From this you develop your own comicbook plot and story. For me, the lines on the woman’s head makes the car appear to be going at great speed while the man’s almost evil glare suggests a dastardly plan – but what? Perhaps crashing the car? Driving the woman to the woods to kill her? Or have I seen too many movies? For all I know they could be driving to a nice restaurant for a romantic meal! But the best art is open to interpretation I guess. Overall, the Pop Art Design exhibition is fantastic. I think it could appeal to everyone of all ages. Children would find the bright colours and odd structures fascinating while seasoned art aficionados can see all their favourite pieces. The exhibition is ideal for those who have a slight interest in art, yet are new to Pop Art like myself. It’s a great introduction for beginners and I would highly recommend it. I would also recommend downloading the app – available for iPhone and Android – for the exhibition as it gives you audio descriptions to the key pieces of work, which I forgot of course! I’ve only scratched the surface off course, there are over 100 pieces on display, so go check them out! Have you visited the Pop Art Design exhibition? What is your favourite piece of Pop Art? Tell me in the comments section below!